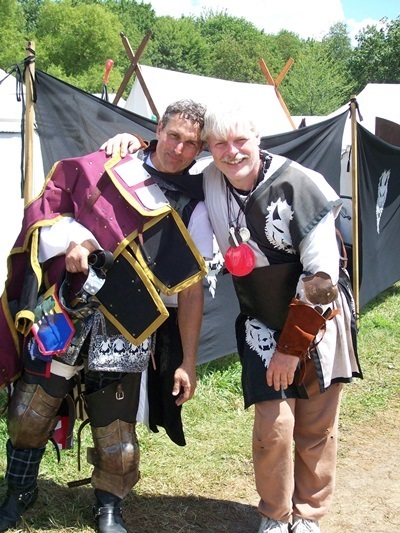 Our heavy fighting includes the use of Siege Engines as well as combat Archery when conditions permit. See Archery page for more on this topic. 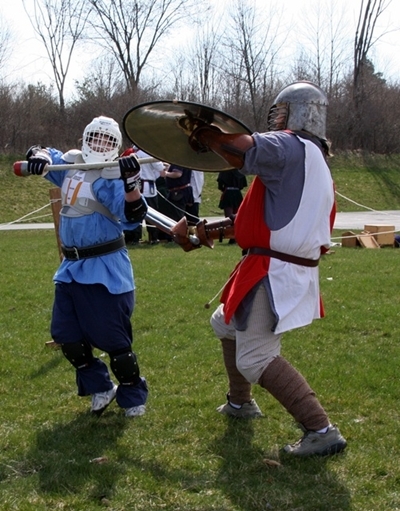 Heavy fighting encompasses both melee or "battle" fighting as well as one on one "tournament" combat. 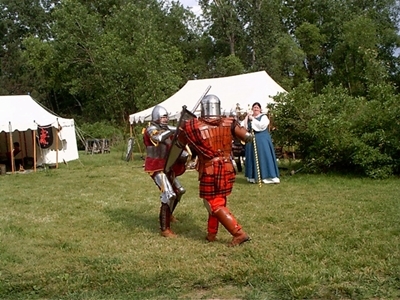 Both forms for adults use the medieval "training swords" or wooden swords in the foot combat mode - no hitting from horses. 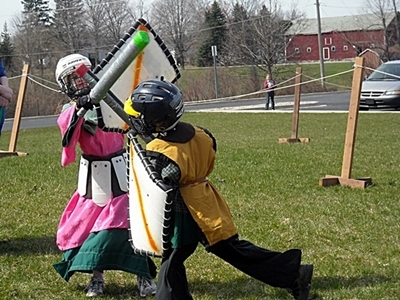 For the youth, there are "boffer" swords at various levels. 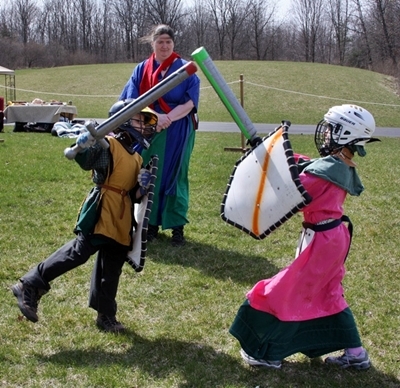 The older youth do use a from of rattan sword to transition to adult forms of fighting. In all cases - safety first! The history of SCA fighting is below. 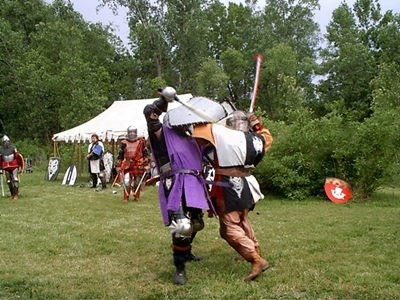 For information on the web, you can go to the Middle Kingdom's armored combat web page http://www.midrealm.org/marshal/ To see fighters in action, there are weekly fighter practices close to We(a)ldlake. 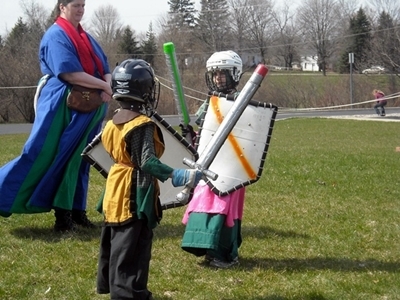 You can join see the Barony of Cynnabar (Ann Arbor, MI) practice on Sunday afternoons, with information at http://marshal.cynnabar.org/, or the Barony of North Woods fighter practice (in Lansing, MI) at the field behind Demonstration Hall (MSU Campus--Red Cedar and Chestnut Roads; just west of Spartan Stadium) from 6 - 9 pm on Wednesdays, weather permitting. 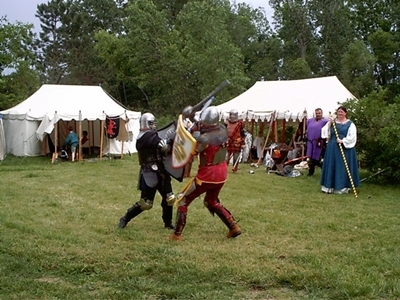 Fighting in the SCA evolved from what happened when two armed knights were unhorsed and had to fight on the ground. It resembles nothing so much as medieval foot tournaments. 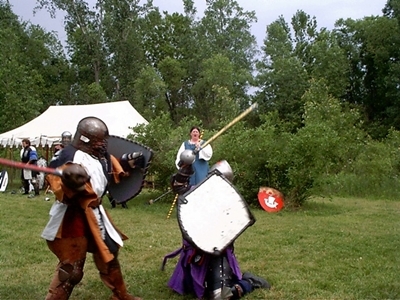 There are two basic types of SCA fights: single combat, and group or team battles, known as melees. SCA fighting does have rules. The first, and most important rule, is that each and every fighter on the field has honor. The fighter keeps faith with his honor by accepting blows that would be killing or wounding (more about this a little later). The second basic principle is like the first; A fighter keeps faith with his brother fighters by acknowledging his opponent's word -- if he says a blow was too light to cause injury, then it was light. Since we prefer that no one get hurt, SCA fighting is done with real armor (made with leather, metal, padding, kydex, etc) and rattan swords. Rattan is that bamboo-y stuff, only with a solid core, that furniture is made of. Rattan, surprisingly enough, is springy enough to absorb some of the force of the blow (although blows are *real solid*) and light enough to approximate a real steel sword. Swords are made by wrapping rattan staffs with strapping tape, covering them with duct tape for aesthetic reasons, and attaching some sort of crosspiece or guard. 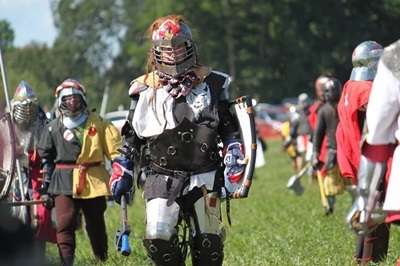 Armor is much more complex -- some armor, being made of steel, rivets, leather, etc, can take more than 40 hours per piece of armor (for example, a gauntlet, or armored glove, with moving fingers and joints can take upwards of 75 hours to complete). 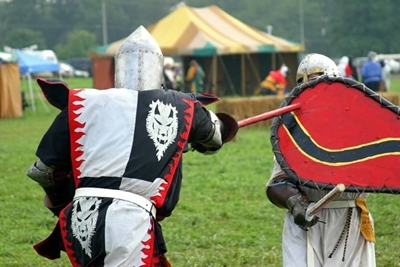 There are several essential and required pieces of armor -- a helm, and protection for the neck, cervical vertebrae, elbows, knees, kidneys, hands, and groin. 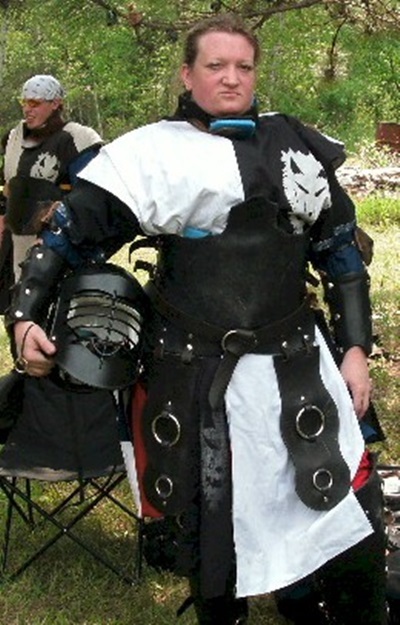 In addition, most SCA fighters wear chest, leg, arm and forearm, and foot protection. Before being allowed to participate in combat without close supervision, each fighter is trained by senior fighters, known as "marshals." This training aims at ensuring that the fighter is safe to himself or herself and to others, and typically lasts a few months. 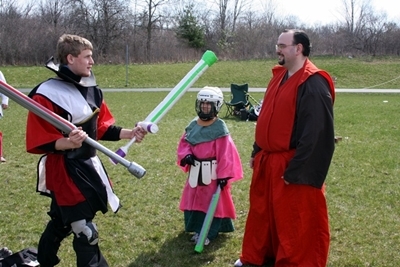 As part of this training, the novice fighter is taught how to recognize a "good" blow. Each fighter judges whether blows received in combat strike hard enough to do injury through armor. If the blow is "good" to an arm or leg, the fighter will give up use of that limb; if the blow is good to the head or body, the fighter is "dead," and falls to the ground, signaling that his opponent is victorious. At the end of training, each fighter must prove to a panel of marshals that he is competent to fight on his own. If the panel decides the fighter is safe (not good, you understand, but unlikely to hurt him or herself or an opponent) they authorized him or her to fight in tournaments. This process (from starting to fight to being authorized) can take from a couple of months to a year or more.